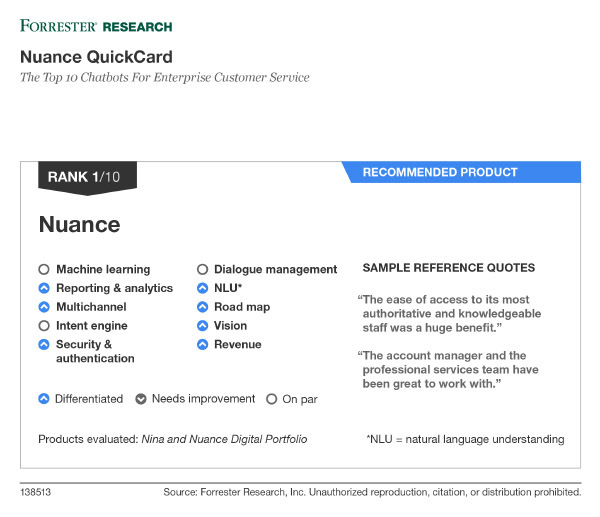 Nuance Nina Named a Recommended Product in the June 29, 2017 Forrester Report, "The Top 10 Chatbots For Enterprise Customer Service"
Nuance is honored to have received the #1 ranking among the 10 chatbot/virtual assistant vendors evaluated, earning the ranking of “differentiated” for reporting & analytics; multichannel; security & authentication; Natural Language Understanding (NLU); roadmap; vision; and revenue. Introduced in 2012, Nina was one of the first virtual assistants for customer service. Today, Nina is a powerful “design once, deploy many” customer engagement platform that supports a consistent experience across Web, Mobile, IVR, Messaging (e.g. Facebook Messenger and SMS) and IoT channels such as the Amazon Echo via Alexa. Nina has been adopted by global market leaders including the Australian Taxation Office, Coca-Cola, Domino’s, Garanti Bank, ING Netherlands, IP Australia, Jetstar, Swedbank, USAA, Windstream and more. Download the report to read Forrester’s assessment in full.